When I heard that Elaine was writing a book about turkey, the first thing I thought was, “I hope there’s a Thai recipe in it!” Well, it is like she was reading my mind, because the very first recipe is Thai Turkey Salad! This is a compendium of things to do with leftover turkey, or to do with those turkeys you picked up on sale after a major bird-eating holiday. I have been reading Elaine’s blog Mortgage Free in Three for quite awhile now, at least a year. Her tag line is One Mum, Two Kids, Three Years and she has a big bad goal of paying off her mortgage in three years. In order to do so, she has whittled down her spending to an absolute minimum, yet has managed to raise two young men who are absolutely foodies. I like to say that she can squeeze blood from a stone, but she prefers to call it the “rubber chicken” game when it involves chicken and she stretches it as far as absolutely possible. 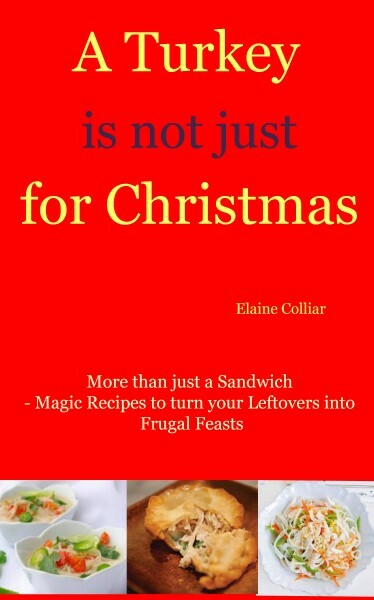 All of this is to say that Elaine’s blog is full of fantastic recipes that can be made for pennies and she has now given us even more, in the form of a book called A Turkey is not just for Christmas . It is available from Amazon for under five dollars and can be read on nearly any electronic device, including iPads and your computer. This book full of turkey leftover ideas and fresh turkey recipes would make a great “stocking stuffer” equivalent gift for the cook or foodie in your family. I don’t know if you realise this, but you should be reading this book in a Scottish accent and up here soups are serious business. The turkey recipes are split into sections on Starters, Soups, Main Meals, Snacks, Slow Cooker Options and Pressure Cooker Options. One of these days I am going to learn how to cook with a pressure cooker… I hope Elaine writes a book on that soon. For now, I think I’ll have to stick to Moroccan Tagine with Turkey and maybe a Thai Turkey Salad. Do you cook with turkey outside of the main turkey holidays? I absolutely LOVE turkey so YES I do eat it outside of Thanksgiving! You sound like one of my friends, she bought five turkeys when they were on sale at Thanksgiving! !